Swaddle Set includes: 1 swaddle pod, 1 warm swaddle pod, 2 knot hats. A swaddle pod is perfect for babies from birth up to 6-9 months. It helps to ensure safe and calm sleep of your baby. The set includes swaddles and hats that suit in color, so you can create your own combinations and styles for your kid. Why swaddle? It recreates a familiar womb like, protected feeling, a baby is warm and embraced and this calms him down and makes him sleep well. At the same time in this swaddle a baby can move arms and legs which is important for proper joints development. A swaddle pod is ideal for newborns and premature babies preventing them from startling awake by their own hands movements. Why swaddle pod? 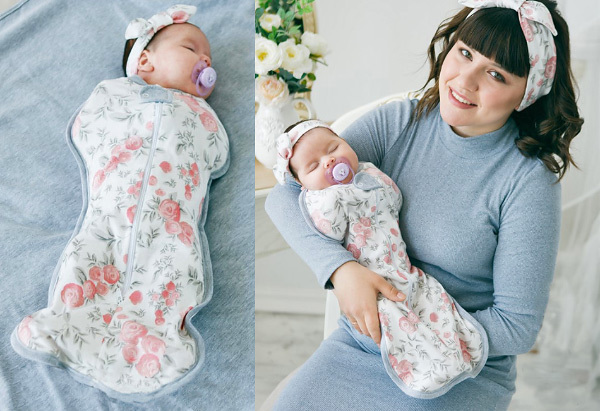 Comparing to a classic swaddling blanket this pod saves a lot of time! It is so simple, just zip baby into it! Jersey fabric is ideal for swaddle pods: it stretches well with babies movement, but keeps its form perfectly. It is dense enough but not too thick so that a baby is not too hot and will not be tangled in fabric. Two way zipper, can be open from both sides: for easy diaper changes. Zipper head is covered with a button strap to protect a tender skin of a baby.